Lifelong Spider-Man fan Donald Glover will finally be able to put his favorite superhero on his list of official jobs. 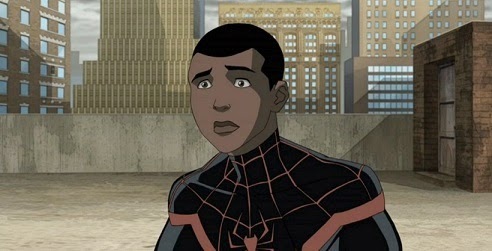 Next year he'll be voicing Miles Morales, the mixed race Ultimate Spider-Man from the comics in 2011, in a dimension hopping episode of Disney XD's Ultimate Spider-Man: Web Warriors. He'll come into contact with a parallel world trekking Peter Parker and both characters might be moved by the encounter. At least it's a start. It's about time. It'll be a big occurrence for Miles as he'll be meeting his hero, who has died in his own universe. Maybe he'll learn a thing or two about balancing his school life, being a kid, and the new-found responsibility of being a superhero. "I never liked Superman that much, because I was like, 'Yo, this dude can't die. It's too easy,' " Glover says. "Batman is pretty fly. He's a close second, just because he doesn't really have powers. He's just a justice-driven vigilante. "Spider-Man is the best because you just don't know who he is, and he's funny and he's poor. I understand Spider-Man a lot on that level. He's just trying to make it." We need some more diversity in our superhero stuff. Come on Marvel and Disney, we need this. Here's another post I did quite a while ago about the subject of "No Miles Morales Coming to Film." We need a live action Spider-Man without James Garfield constantly pursing his lips. It's annoying and Peter Parker has gotten a bit cocky in the current movies. We could use something new and interesting like Morales' story.